Worship at Hope begins at 9:30 am followed by a lively time of conversation and coffee. Sunday School classes for all ages begin at 11:00 am during the school year(September - May). 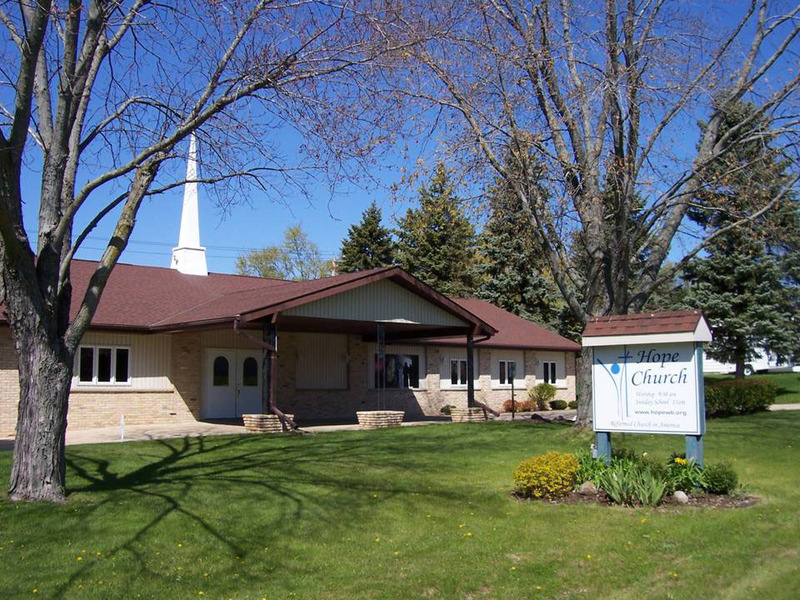 Hope Community Reformed Church was organized in 1981, and since that time has established itself in the growing community of West Bend. Our church building on Lenora Drive was purchased in 1992 and was expanded during the latter part of the 1990s. Several of our members have gone on to seminary and later entered the mission field or have become ordained pastors in the RCA. Our congregation is small(less than 100) with individuals from many different professions and occupations as well as various church backgrounds. Our desire is to proclaim the Word of God as written in the Bible and to proclaim Jesus Christ as Lord and Savior. 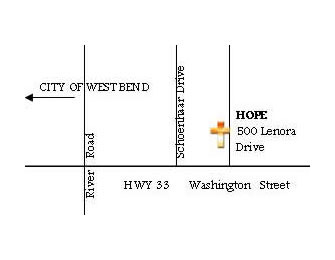 Find us on the northeast side of West Bend. From Hwy 45 in Washington County, exit east onto Hwy 33. Turn north onto Lenora Drive. The Church is located on the left-hand side of the road. Church should be a place where we can receive comfort and healing for our hurts, be challenged to grow into what God wants us to be, and be accepted even though we may be wrong. It should be a place where we can hear truth and adjust to the truth when necessary, as well as to experience the personal nature of God in relationship to ourselves. Sunday is a family reunion where those who love God come to worship and fellowship with other believers. We learn from the Bible that the Christian life is mean to be lived in community with others. The Bible gives us directions for how we are to function as a church, how to worship, how to structure leadership, and how we are to show love toward one another. The criticism that "organized religion is unnecessary and unspiritual is really a criticism against God Himself, since His Word clearly teaches otherwise. We are in fact explicitly encouraged not to forsake the gathering together with other believers because it is so vital to our faith. At Hope Church you can experience the warmth and comfort of being part of a family. Visitors are encouraged to come and will be greeted with a warm welcome and friendly hospitality. We welcome into fellowship anyone seeking Jesus and earnestly desire to assist each other in becoming the whole and joyful people that God wants us to be through the strengthening of our faith and Christian life. Please be sure to browse the rest of the website and get to know us better. We are Bible-based, founded on the long history of the Reformation to the present, and recognize Jesus Christ as the only Lord and Savior of humanity. Accessibilty to our building for those with physical disabilities is available. We have a wide entrance with double doors, a flat surface, and parking available close to the main entrance. We also have a wheelchair, walkers, and crutches available to those who may require assistance with mobility. Whatever the need, we will try to be of assistance.